HOLT: Good morning, everyone. Welcome to a special split edition of TODAY on this Sunday morning. I'm Lester Holt live in Tucson , Arizona . JENNA WOLFE, co-host: And I 'm Jenna Wolfe inside Studio 1A here in New York . And what a horrible tragedy. Lester , details, I understand, are still emerging there this morning. HOLT: A lot being sorted out this morning, Jenna . It all happened here at this shopping center you see behind me where Congresswoman Gabrielle Giffords was hosting a sidewalk gathering for constituents. A gunman then walked up, opened fire on her and then on the crowd. Six people were killed, among them a nine-year-old girl and a US district judge, federal judge . At least 13 others were injured, including Congresswoman Giffords . She was shot in the head, but remarkably survived after undergoing brain surgery. She remains in critical condition this morning, but doctors say they are hopeful. Meanwhile, authorities have one suspect in custody. His name is Jared Loughner . He's 22 years old. At this hour officials are hunting for someone who they think -- they think may have been associated with the suspect. There's the picture that they're hoping someone will recognize and call with information. Coming up, we're going to get the very latest from here in Arizona . We'll have a conversation with two people who helped subdue the shooter until police arrived, Jenna . WOLFE: And then, Lester , we're also going to take a closer look this morning at some of the victims of the shooting, including the youngest, a nine-year-old girl born on the day of the 9/11 attacks. She had just been elected to her school student council and went to see the congresswoman because she was interested in government. So a sad story there, Lester . LESTER HOLT, co-host (Tucson, Arizona): We want to begin our coverage, Jenna , with NBC 's Miguel Almaguer . He joins me with the latest on the timeline of events and where the investigation stands this morning. Miguel , good morning to you. MIGUEL ALMAGUER reporting: Lester , good morning. Again, those staggering numbers. At least six people are dead, another 13 injured. The FBI and the sheriff's department is conducting a joint investigation. This morning they believe they have the gunman in custody, although, as you mentioned, they are looking for another suspect. They say the congresswoman was the target. Panic and chaos outside a suburban Tucson grocery store. Saturday, just after 10 AM , a gunman begins his rampage. 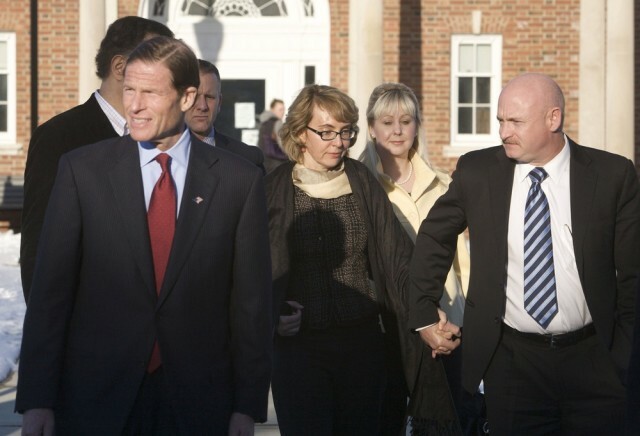 Congresswoman Gabrielle Giffords was meeting with her constituents when she was shot in the head at point-blank range. The gunman turned his semi-automatic pistol on the crowd. Unidentified Woman: There was eight pops that just set off really quickly, and the next thing we know there was just a frenzy of people. ALMAGUER: Witnesses say bodies were scattered everywhere, the most gravely injured airlifted. Some survivors drove themselves to the hospital. Several victims are in critical condition. Congresswoman Giffords was able to communicate with her doctors while being rushed into surgery. Dr. PETER RHEE (Medical Director, University Medical Center): She was shot through and through on one side of the head. It went through her brain. ALMAGUER: The suspected shooter is Jared Lee Loughner , a 22-year-old with a criminal history. Police say Loughner may have an accomplice and are now looking for this man for questioning. Mr. CLARENCE DUPNIK (Pima County Sheriff): We're not convinced that he acted alone. There is some reason to believe that he came to this location while with another individual. ALMAGUER: Investigators are looking into YouTube and MySpace accounts reportedly registered in Loughner 's name, but the online rants make little sense. The bloodshed could have been much worse. Mr. DUPNIK: He probably would have shot other people had he not been tackled by two people. ALMAGUER: Investigators quickly sealed off Loughner 's neighborhood, just minutes from the crime scene. Unidentified Man #2: It's extremely creepy to know that He lives so close to me and he does -- he wants to shoot somebody. ALMAGUER: Although police believe the congresswoman was targeted, the other victims appear to be random. Among the dead, a prominent 63-year-old federal judge ; a 30-year-old aide to Giffords who was engaged to be married; and a nine-year-old girl, the youngest victim. President BARACK OBAMA: Obviously our hearts go out to the family members of those who have been slain. ALMAGUER: Re-elected to her third term in November, Giffords met with the public on a regular basis. Shortly before she was shot, she tweeted, "Please stop by to let me know what's on your mind." Outside the hospital Saturday night, tears and a tribute. Unidentified Man #3: You cannot kill hope with a bullet. ALMAGUER: A community praying together for the survivors and also remembering the dead. On Saturday, doctors said they were optimistic about the congresswoman's recovery. We hope to have updated information on that later on today. And even as late as yesterday, Lester , there was a scare outside of her office. It turned out there was a suspicious package there, but it was not a threat.